Writer. Poet. Dancer. Activist. 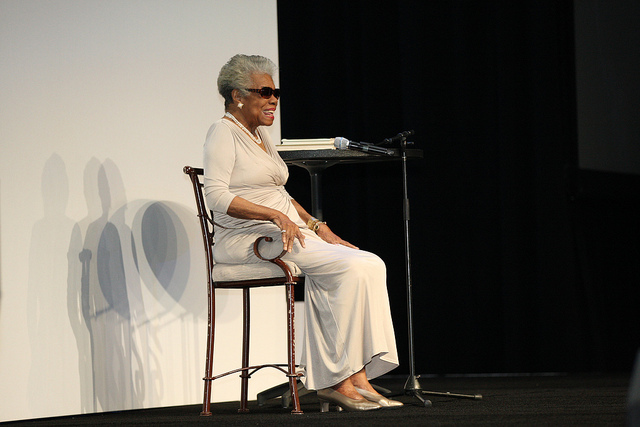 Maya Angelou has taught us so much with her life’s work, it feels surreal she won’t be here to instruct us any farther. But will always remain our North Star; shining bright in the midnight sky with an overpowering luminosity that will transcend time. It’s hard to accept this kind of loss. Not just for who she was to society’s standards, but what she became for each of us individually: a great aunt. This void is reminiscent of my grandmothers’ passing. It feels like this dark curtain has been drawn over my heart and can’t be reversed without reflecting the weight of the loss. To highlight the point even more she wrote an essay “The Sweetness of Charity,” on how offering a helping hand can enrich the soul. intangible but very real psychic force of good in the world is increased. profit from that grantor’s gift. R.I.P Maya Angelou. May your words spoken and written wrap around us like a scarf with grandma’s lingering scent attached.